Perricone MD Re:Firm Treatment, 1.0 fl. oz. 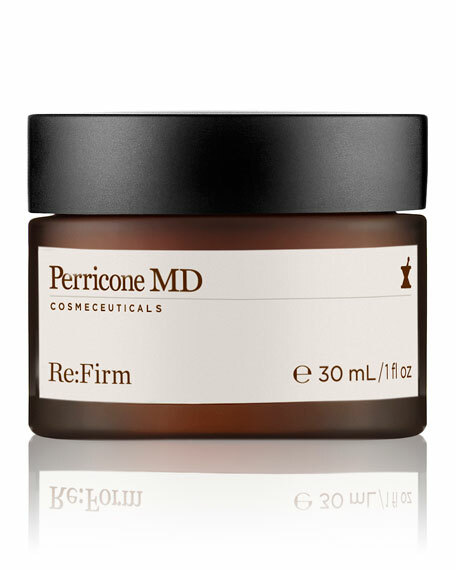 Perricone MDRe:Firm Treatment, 1.0 fl. oz. Re:Firm, a powerful face treatment designed to transform the skin to a dramatically smooth finish while working to help it remember its once youthful form, suppleness and bounce. Dermal Stim Factors work to improve skin elasticity, resilience and density. DMAE firms, tones and tightens skin's appearance for a more chiseled, youthful look. Alpha Lipoic Acid minimizes skin's surface imperfections such as fine lines, wrinkles and enlarged pores, while improving skin texture. Innovative technology from Dr. Perricone mimics skin's own regenerative compounds using Dermal Stim Factors, a proprietary matrix-forming complex that improves skin elasticity, resiliency and density. Delivers dramatic improvements in skin's ability to bounce while improving fragile skin texture and strengthening its barrier function. Re:Firm begins as a smooth solid in the jar and instantly breaks into a luxurious serum upon skin contact, creating a micro-wrapping barrier of powerful anti-aging actives that conform to the face and trigger the skin's re-forming process. Dr. Perricone recommends smoothing all over a cleansed face in the morning. For in-store inquiries, use sku #1714973.